The next Wednesday (the 26th) our BOINC servers will be relocated to the new server-room. The servers will be off-line for about two hours at most if all goes well. Furthermore, as of last week, our BOINC servers are now also part of the LGI grid. This means that scientists in Leiden can now submit 'classical' jobs to LGI, the BOINC servers will pick them up and schedule them to the hosts of volunteers! Finally next Thursday (the 27th) we will be attending the desktop grid workshop in Almere. Альмер типа известное место в гриде. Хотя у них клиент говно. сервер успешно перенесли в новую серверную, всё работает. а мі тем временем 109-е! Билли Бонс сливает по 500 очей в день. в сотне мі будем через месяц. Вообще, или только до той поры когда твой RAC будет >1....10......100 ? Этот проект почему-то оказался у меня самым первым. Уже решено 5 заданий. У меня вопрос. 1 задание решил еще вчера. Но в Состоянии задания до сих пор написано Ожидание подтверждение о приеме данных. Сколько это может длится? Microsoft Windows 7 Ultimate (64-bit), DualCore Intel Pentium E2160@ 3000 MHz, 2048 Гб - озу, ATI Radeon HD 5870(gpu 960Mhz), ATI Radeon HD 5770(gpu 960Mhz), 250 и 500 Гб винты. В боинке пункт "проекты" выдели данный проект и нажми кнопку "обновить"
Today Mark Wijzenbroek handed in his report on the phonon project. Read all about it here. Furthermore, two undergraduate students are currently trying to model hydrogen dissociation on a copper slab including the lattice dynamics on BOINC through this project and on BigGrid resources using LGI. More on that soon. In this thread the development of a new model for the reactive scattering of molecular hydrogen from metal surfaces in which phonon effects are taken into account is presented. When studying the reactive scattering of hydrogen from metal surfaces, most theory is based on using models in which the atoms of the metal surface do not move. The surface atoms are placed at their ideal lattice positions during these simulations. Despite previsously made arguments concerning the mass-mismatch between the hydrogen atoms and the metal surface atoms, say copper, the lack of a temperature dependance in the reactive scattering of hydrogen on coper in experimental data and the renowned normal-energy scaling law observed for the reactive scattering of hydrogen on copper, recent advanced and state-of-the-art six-dimensional quantum dynamics simulations show discrepancies when compared to the available experimental data. Experimentally accessible parameters like the rotational quadrupole allignment, the rotational in-elastic diffraction probabilities and the reaction probabilities calculated using these advanced dynamical methods on highly accurately calculated potential energy surfaces based on density functional theory still do not reproduce the observed qualitative behaviour in experiments well. It is currently unclear what causes the miss-match and it is often attibuted to two assumptions in the models; 1) neglect of phonon effects and 2) the neglect of electron-hole pair excitations. Currently on this Leiden Classical BOINC project, the first steps are being undertaken to include surface atom motion effects into our models. To this end a new application is being developed based on previous work. The hydrogen on copper application already running on this project is being altered by a MSc student Mark Wijzenbroek. He will adapt the existing code to allow for simulations of the reactive scattering of hydrogen on a static copper surface but with the surface atoms being displaced from their ideal lattice positions. The surface atoms will be displaced according to the observed average displacement as a function of the temperature of the metal. Currently this change in the model does not allow for energy excange during the scattering event of hydrogen, but it does introduce extra corrugation and anisotropy into the dynamics. It is believed that this extra corrugation and anisotropy has a large effect on the calculated experimentally accesible parameters discussed above. To this end the existing model potential describing the interactions of hydrogen with a copper surface is being modified and test calculations on the system with the surface atoms displaced are to be compared to simulations in which the atoms have not been displaced. If large differences are found, the static but corrugated surface (the 'wrinkled surface') effects are important and should be included in more sophisticated models and methods. 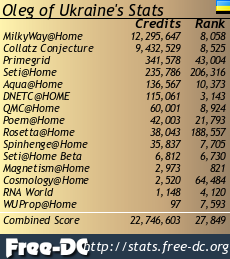 To this end a large number of classical trajectory calculations are needed and BOINC will help us with that! More news and information on this project will be made available in this thread. It turns out that some of the WUs cannot download the input files (they were missing); these files have been created now. Due to a disk failure on one of the servers, the database and the replicated copy of it got corrupted. A restore was done from a known working backup of yesterday. Some WUs which were send out in the mean time might have been lost due to this. Currently the project runs on just one of the servers, later this week the second server will be put to action again. Sorry about that! Last week two students finished their LO1 project on Leiden Classical. More information regarding their project can be found here. Furthemore, more progress was made on the phonon project. See the latest info here. As of this week the ClassicalBuilder has been updated. Now students can also submit Classical calculations directly through LGI (Leiden Grid Infrastructure) to this project, to local clusters, the national supercomputer and BigGrid resources from within the builder. Also more news on the phonon project can be found here. Furthermore, as of this month two new students started their LO1 project; they will be using Leiden Classical and BOINC to run their project pretty soon. 2012-04-19: Next week six new graduate students will start their projects on Leiden Classical. Furthermore, a paper on the results of the phonon model (for which we used this BOINC project) has been submitted to the Journal of Chemical Physics. Hopefully it will be accepted.